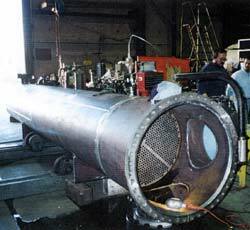 Tubing used for heat exchanger service may be either welded or seamless. The welded tube is rolled into cylindrical shape from strip material and welded automatically under precisely controlled manufacturing conditions. A seamless tube may be extruded or hot pierced and drawn. Both are high quality products. Alloys are available only as seamless products, whereas most commercial metals are offered in both welded and seamless. Tube size is specified by outside diameter and wall thickness. Almost all heat exchanger tubes range between a 3/8 inch and a 2 inch outside diameter. Most popular are the 5/8-inch and 3/4 inch sizes. These sizes give best all-around performance and are most economical in many applications.